Petromax has new products for a perfect outdoor kitchen over the campfire. The new Petromax Fire Bridge, for example, enables erecting a large camp kitchen with little effort. On several fire places, hot beverages and dishes can be prepared, cooked, grilled and kept warm simultaneously. Cast-iron Dutch Ovens, Pans, Kettles, Grilling and Fire Skillets, Percolators and a Grilling Grate can safely be suspended over the open fire, using the Petromax Fire Bridge. 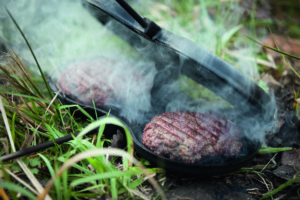 But Petromax also has a new, cast-iron product for cooking and grilling directly in the fire: Juicy burgers with a unique flavour are perfectly made with the Petromax Burger Iron, directly in the campfire or ember. A ridged surface gives the burgers the typical grilling pattern. With the new products, Petromax underlines its profile as one of the leading German manufacturers of equipment for light, fire and outdoor cooking. Good equipment is needed to make cooking in the open a real pleasure and success, and Petromax is the specialist for this. Petromax continuously presents new and coordinated products for the camp in nature. 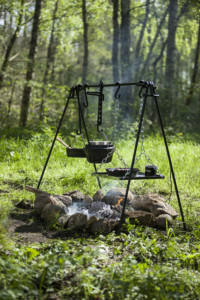 The developers at Petromax get their inspiration from cowboys and medieval kitchens, refine well established equipment and bring it to the outdoor chefs of today. The Petromax Fire Bridge has been influenced greatly by cowboy experiences and it expands the culinary possibilities for cooking outdoors. While the delicious main dish is cooking in the Petromax Dutch Oven suspended over the ember, marinated vegetables are roasted on the grilling grate as appetisers. And, at the same time, a moist cake is prepared for dessert in a cast-iron cake pan held by a hook at perfect distance to the fire. Right next to it, coffee is freshly brewed in the Petromax Percolator. The Petromax Fire Bridge stands for variety and organisation when cooking delicious meals outdoors – also for many people. The Petromax Fire Bridge is a solid construction made of coated steel which, thanks to the clever eye construction, is assembled and disassembled in no time and without any tools. 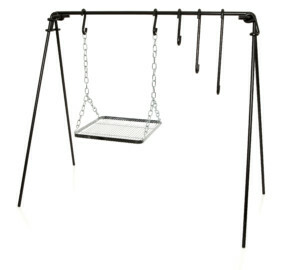 Four feet hold the stable crossbar at a height of 45.3 in, which provides for cooking over one or more fire places. 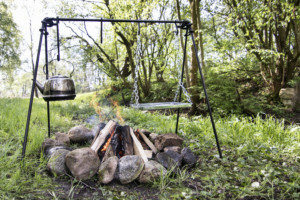 Three hooks of different length hold everything at perfect distance over the fire. Perfectly suited are cast-iron Petromax Dutch Ovens, pans, kettles and percolators. 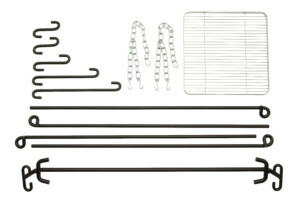 But that is not all: A grilling grate is also supplied with the Petromax Fire Bridge, which can be variably suspended at a chain to optimally regulate the heat. Smart detail: A framing, raised edge safely keeps grilled food as well as pans and Co. at its place. The Petromax Fire Bridge adds benefit to the campfire. It organises the cooking place in various ways and allows you to simultaneously cook, grill and keep dishes warm. The Petromax Fire Bridge masters any challenge of cooking over the fire. Its stability provides safety, allowing you to suspend and easily move heavy, cast-iron cookware. Burgers cannot be left out of an outdoor kitchen and the new Petromax Burger Iron proves that Petromax have thought cooking at the campfire through. 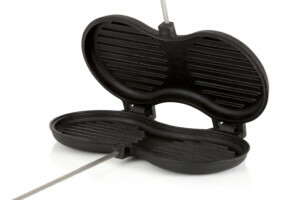 After the popular Waffle and Sandwich Iron, Petromax extends its product range by the Burger Iron, which even makes a grill to prepare them obsolete. The Burger Iron is a cast-iron pan which holds two burger patties with a diameter of 4.7 inch each. As soon as the cast iron is heated up in the fire or on the charcoal, the meat dough can be put into the pan. After closing the burger iron, the remaining heat will roast the burgers to the desired degree. The long stainless-steel rods ensure a safe distance to the fire when grilling. With the wood handles at the end being flattened on the inside, the burger iron closes optimally. 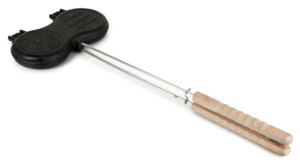 A hook holds both halves of the burger iron tightly closed during roasting. Holding the wood handles, the burger iron can be turned safely to evenly heat up both sides in the ember. When opening the burger iron, the meat presents itself at its best: The ridged surface will give the burger patties the typical grilling pattern. As all cast-iron Petromax products, the burger iron will develop a typical patina with each use, which prevents the burgers from sticking. The patties can easily be removed from the pan and, along with your favourite ingredients, turned into a perfect burger. Also cleaning the burger iron has been thought through by Petromax: To rinse the pan, the halves can easily be separated at the hinge and cleaned individually. To easily remove roast residues in the grilling structure, there is the new ridged Petromax Scraper for cast iron. The teeth of the scraper perfectly match the ridged structure and remove all residues in a single swipe. Rinsed with clear water and dried, the burger iron is quickly ready for transport. Apropos: With a weight of 5.5 lbs, the burger iron can be stored in the backpack to prepare burgers at a campfire, wherever the hike takes you. Petromax is a leading German manufacturer of equipment for light, fire and outdoor cooking, and their coordinated product world combines tradition and innovation in a unique way. All Petromax products are of highest quality, extremely durable and feature elaborate details. 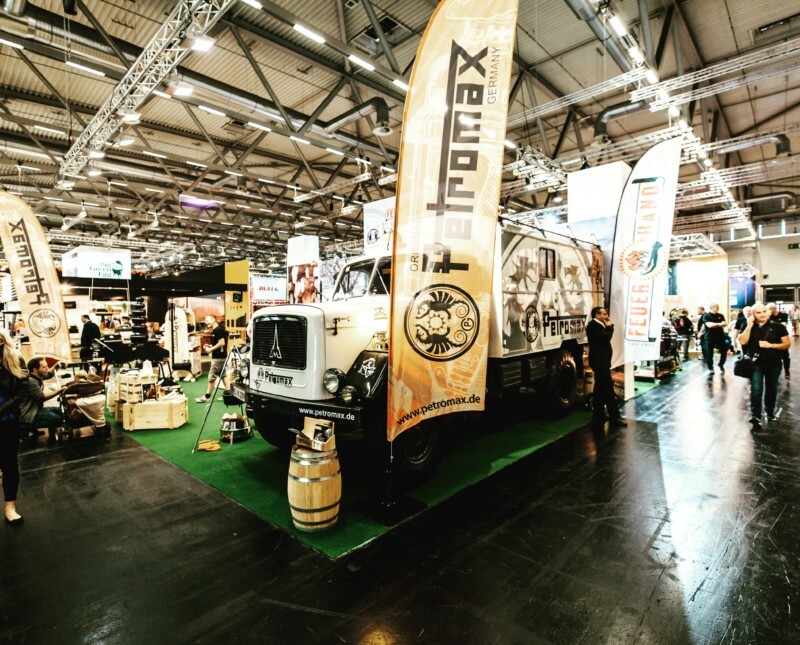 Experiencing raw nature with traditional and yet well designed equipment is the focus of Petromax’ product world, which can be acquired through an international network of specialised retailers with currently more than 3,000 shops as well as the online shop. Petromax’ management consists of Jonas Taureck and Dr. Pia Christin Taureck.